Articles looking at the importance of play for infants and toddlers including ideas for toys and age appropriate activities with the view to allowing toddlers to play independently. Days with my children are so hectic, so full on. Life with a three year old and a two year old can seem chaotic from the moment the first sounds of little pitter pattering feet make their way to our bedroom door in the morning, to the time they finally succumb to sleep as their heads hit the pillow at night. Days with my children always seem so unproductive. On most days, neither of my children opt to have day sleeps so my opportunity to wash clothes, cook dinner, vacuum the floors, make the beds and generally keep the place somewhat tidy etc is severely impaired. When my children are up and awake they command my attention and most of my day is taken up either helping them sort through disagreements or just needing to be there whilst they play. I try to steal moments to run the stick vac over the floor or peel some onions or gather in the washing but I find it difficult to multitask and find my attention when spread between two things, is not very effective on either of the things. I can’t tell you the number of dinners I have burnt as a result of this! 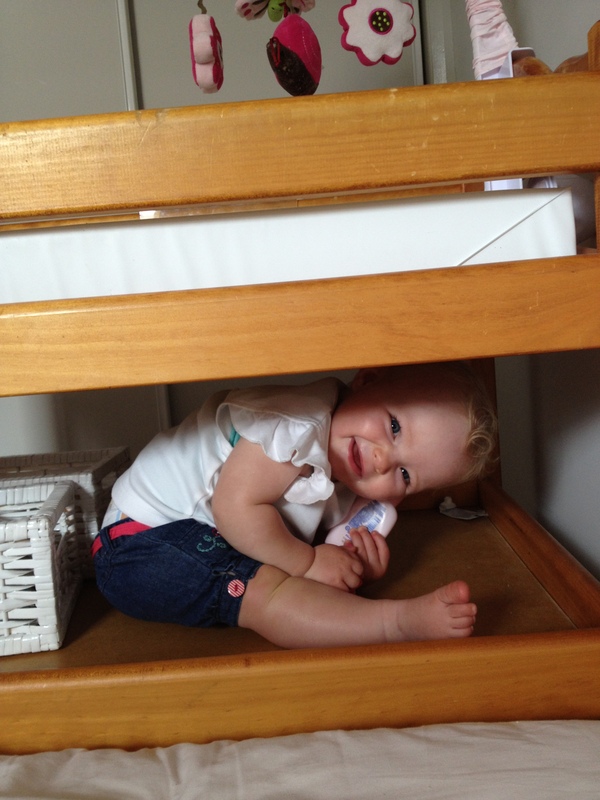 I often wonder why my children need me to be with them whilst they play all – day – long! Even when I go to the toilet, my children follow me in and try to scramble onto my lap – is nothing sacred? Independent play has never been high on my eldest daughter’s lists of priorities. On those rare occasions she seems to be occupying herself quietly, inevitably it’s because she is emptying out a tube of toothpaste or drawing on the tiles with her crayons or pulling all of the wipes out of the wipes container or smearing my mascara all over her face. I can’t be sure whether her dependence on us for entertainment is a personality trait or a product of her early-childhood upbringing, whereby we showered her with an abundance of attention, played incessantly with her and made life thrilling and exciting whenever possible. Either way, finding her engaged in anything for longer than five minutes is very rare. Bath time is my favourite time of the day. A time when my daughters are both happily occupied for upwards of half an hour and when I get to throw on the washing, tidy up and get dinner going. They sing at the top of their lungs in separate baths and engage me in conversation, always making sure I am nearby and being mindful to offer me a bite of their ‘icecream’ or a ticket to see a fabulous bubble creation they have made. I continually glance in on them as I march around the house in double time getting on top of as much housework as possible before they call out for me that they want to get out. But it’s not enough. I want more. I want more for my daughters and I want more for me. But how is that possible? Well, as I have found out – it is! Part of Magda Gerber’s care philosophies for raising young children to be confident, independent and self-assured is to shower them with attention and playfulness during care giving moments. If we fill their buckets with so much love and devotion during these tasks that they are saturated with us then the theory goes that they will no longer crave or need us to be right by them and involved in their free play time for the entire day. I have known this philosophy for quite sometime and for many tasks such as nappy changes and meals, this is exactly what we try to do but I feel we have been in such a vicious cycle with the bath time thing that it has been a hard one to change. 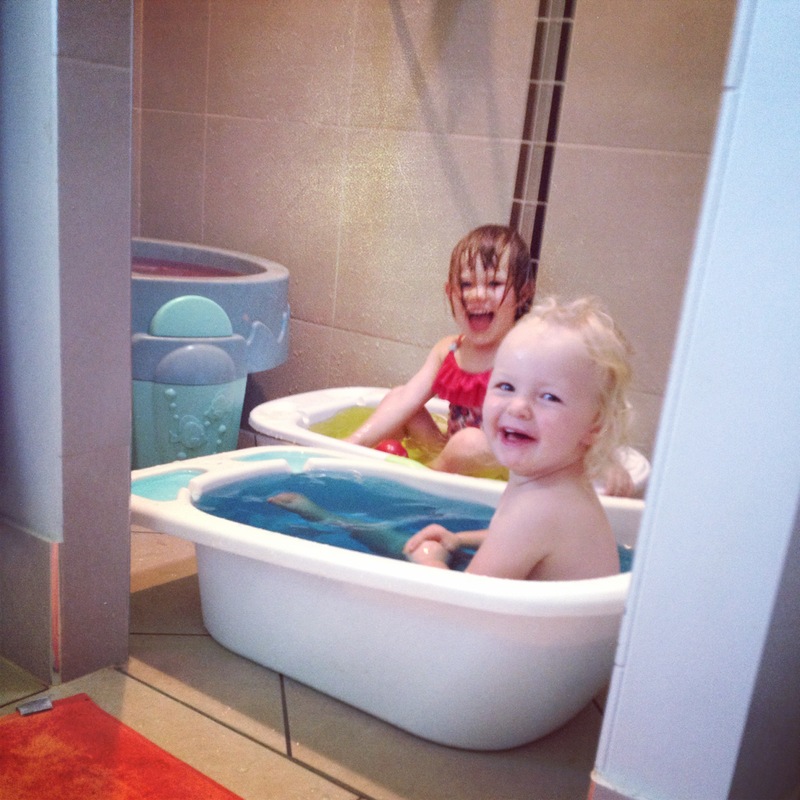 That time spent when the children are in the bath has been so precious to me for keeping our house (and therefore me) sane. So much so that I have been unwilling to give it up. But I have done it. I now am a fully attentive, playful, sing songy, fun loving mother during bath times and I love it. And more importantly, my kids love it! We all sit on the floor of the shower together (well me on the floor and the girls in their baby baths on the floor) and we cook up dinners in little saucepans, make ice creams, build towers, sing songs and generally love life. This is becoming a special time for bonding with my kids and I am starting to see the benefits already. After bath time, the girls are completely happy to play by themselves, they are not so clingy or needy and the afternoons are generally more relaxing. While they are busy playing shops or doctors or bouncing on the trampoline, I am able to get through the same chores I was previously rushing through, peacefully and calmly. In the mornings, I spend close to half an hour sitting with the girls patiently. Observing their play and engaging with the girls when they engage me first either through eye contact, gestures or verbal cues. It is important that they are able to steer their play in their own way, even if it seems boring to me or I can see a better, more exciting way to do something. After a period of time, I find they naturally drift off elsewhere, giving me the time and space to achieve some of my own goals for the day. I believe the change I have seen in them is because whilst previously I was spending nearly the entire day with the children, I was always distracted, trying to grab a moment here and there to tidy, clean and cook. I was not attentive to them. I was not absorbed by them and my focus was split. They knew this and subsequently kept needing me all day long. Inevitably, now, as the day progresses, they find their way back to me and the clinginess returns. At this point I know it is time to address their needs again either through food, rest or undivided attention. Each day I am seeing bigger periods of independent play following a burst of wants nothing time and I am kicking myself that I did not start this earlier. 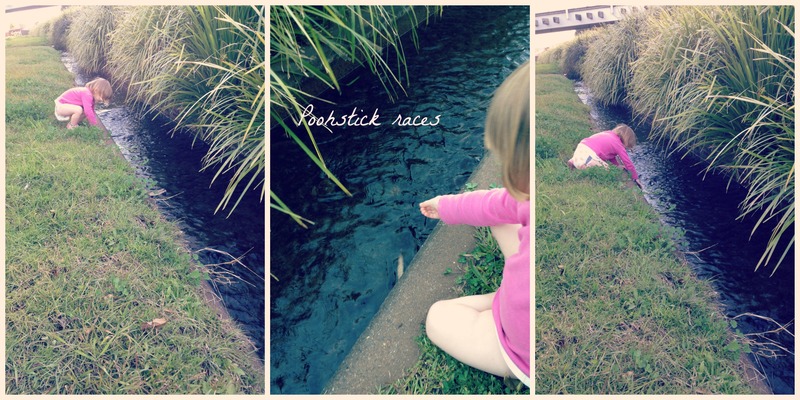 This entry was posted in Parenting Peacefully, Play and tagged Bath time, Care giving moments, filling the bucket on March 16, 2014 by peacefulparentsconfidentkids. 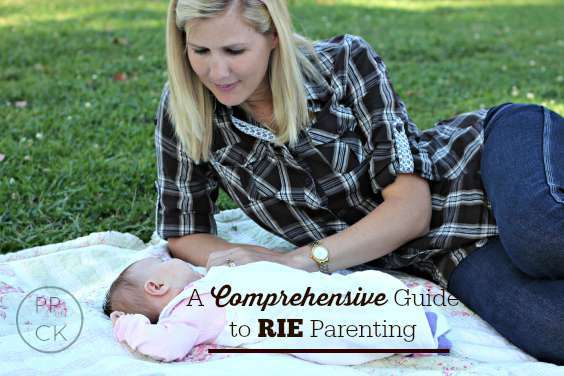 I have been learning about and implementing RIE (pronounced Rye and short for Resources for Infant Educarers) parenting since 2012. Over that time, I have experimented with different parenting techniques, including some that have not been so respectful, but I have always found my footing and the way forward when I have come back to RIE. 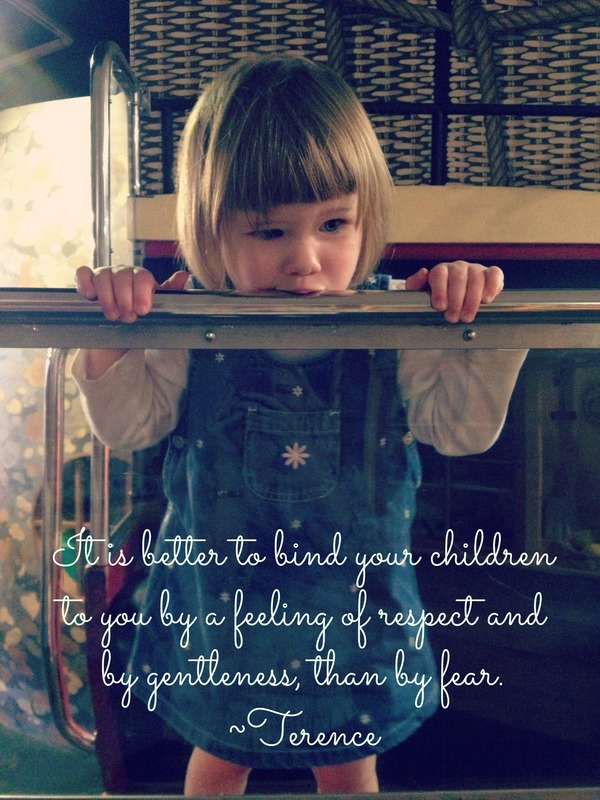 This entry was posted in Building Confidence, Expressing Emotion, Peaceful Discipline, Play, Sibling Rivalry and tagged Acknowledging Feelings, allowing play at age and stage, Building a Trusting Relationship, Gentle Parenting, Respectful Parenting, RIE, Toddler emotion on February 18, 2014 by peacefulparentsconfidentkids. Acting With The Eyes of Compassion – A Toddler CAN Do This! To act with the eyes of compassion is an expression I came across in my past work at a Catholic school. Something about these words struck a chord with me and I think about them often as I go about my daily life. Thinking of the true meaning behind ‘eyes of compassion’ helps me to stay calm when I feel hard done by or when I hear something unkind being said. To me this expression means act with true empathy even when you are not sure what it is that is causing the grief or angst against you in the other person. We can never truly know what it is like for another person as they live out their lives, even our own children and therefore it is important that we continue to treat them with respect and act gently even when they are not able to. It is something I have been able to draw strength from during many of my toddler’s emotional outbursts and I also try to keep these words in mind when I hear criticism of my parenting as I open up the window into my personal life through this blog. I have spoken often of my intentions to ‘teach’ my children through modelling appropriate behaviours in the hopes that my future adult children will adopt these same traits and be confident to use them for their own good in the world. At times, this vision has seemed so far away so I was quite surprised when this week I was delivered a little gift; a glimpse into the future of my children. 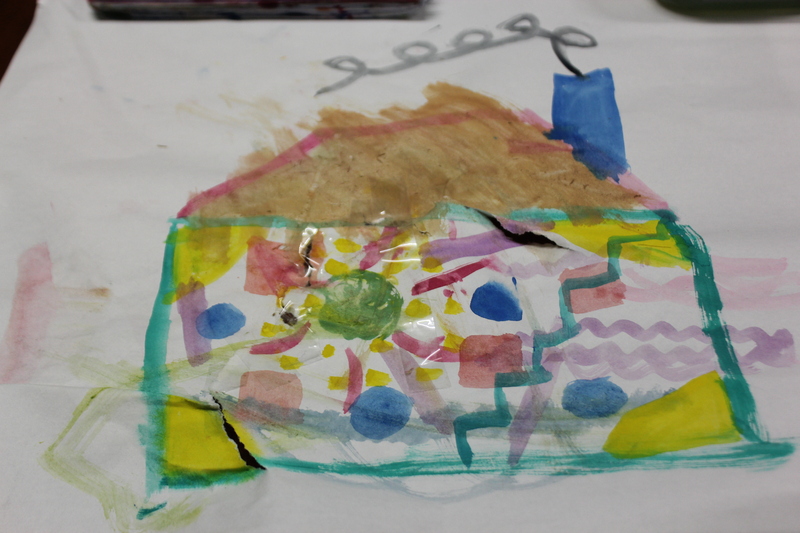 The girls and I were painting with watercolours in the rumpus room. Lucy, two and three-quarters years, asks to paint with these everyday, several times a day. Penny also enjoys joining in and making her own creations. I always sit with the girls at their table and help them to keep the paint on the paper, away from the other furniture and each other. I love to listen to Lucy as she proudly describes in detail the components of her paintings and I have enjoyed watching the girls’ artworks evolve in complexity and confidence over time. I was thrilled recently when Lucy invited me to join her in some painting, fetching me a paint brush and some paper and encouraging me to draw whatever I would like to. Some of you may remember that there was a time when Lucy would not let me draw, paint or colour in with her. I would barely begin my art piece when she would move in aggressively and tear, scrunch or hit away my paper. It seemed at the time that she would see her scribbles and compare them to the neatness and structure of my work and become somewhat jealous or frustrated. When I took a step back and gave her her own space to create without any pressure or preconceived ideas, she was much more content. I think as she has grown in confidence in her own skin, she is now really happy to watch me join in with her and at the same time retains immense pride in all her art work. But that was not my gift. As happy as it makes me being able to paint alongside my children once again, the gift I received went deeper than that. Lucy and I were painting together. Penny had abandoned her work and was happily playing in the hammock swing nearby. Lucy looked over at my painting and asked me what it was. I had really just been doodling so I said I have made some shapes and lines. I framed my patterns with a rectangle and Lucy said to me “Have you drawn Play School (her term for daycare)?” I replied “Does it look like Play School to you?” She said yes so I added a roof and a chimney which she asked to help me colour in. Once finished she asked me to put some stairs inside, which I did. She then surprised me by grabbing the middle of the painting and scrunching it into her hand, tearing the wet paper. I was genuinely upset as I had been enjoying this picture we were creating together and was making plans to hang it up on her art board as a collaborative piece. I decided to let Lucy know how I felt so I said “I was enjoying painting with you. I feel sad that the painting is ripped. I am going to let you paint here now whilst I hang the washing out.” I left the table and went to get the washing out of the machine (in the same room as the paint table). Lucy watched me solemnly as I left the table and then ran off to another room. I immediately felt guilty for making her feel bad about ripping the painting. After all, it wasn’t her fault. She is still very young and learning how to be careful. I imagined that she was running to get her security bunny which is her go-to when she is feeling low. After a few moments, however, Lucy came running back into the rumpus room. She bounded quickly over the bridge (which is the entrance to the room) and looked lovingly at me as she climbed back onto the chair in front of the painting. It was then, in that moment that I saw my gift – it was in her eyes! Those same eyes of compassion that I have been trying so hard to see Lucy with everyday over the past few years were staring back at me. Lucy had gone to collect the sticky tape from the office desk to mend my painting. She sat at the painting for a very long time, working through some intense frustrations (without screaming for my help) as she tried so hard to get the sticky tape out of the dispenser. She pulled long pieces of tape out but couldn’t quite get them to break off. Remembering her cause, she came to me quietly, undemanding and said “I can’t get the tape into little pieces.” I showed her how she could do it and she returned to the table and worked hard until she was happy that the painting was fixed. When she was finished she didn’t come to me for approval, instead she came to me and said “You’re painting is all better, Mummy! Don’t be sad.” and hugged my leg. It had been a hard day up to that point and as I crouched down to her and took her into my arms I let the tears flow as I thanked her for making me feel better. Now, I would never judge anyone who told me that toddlers were self-centered and demanding. In fact, on many days I would whole-heartedly agree. But not on this day. A small act of kindness has shown me just how capable my children are at acting with the eyes of compassion and this time it was me that was the recipient! 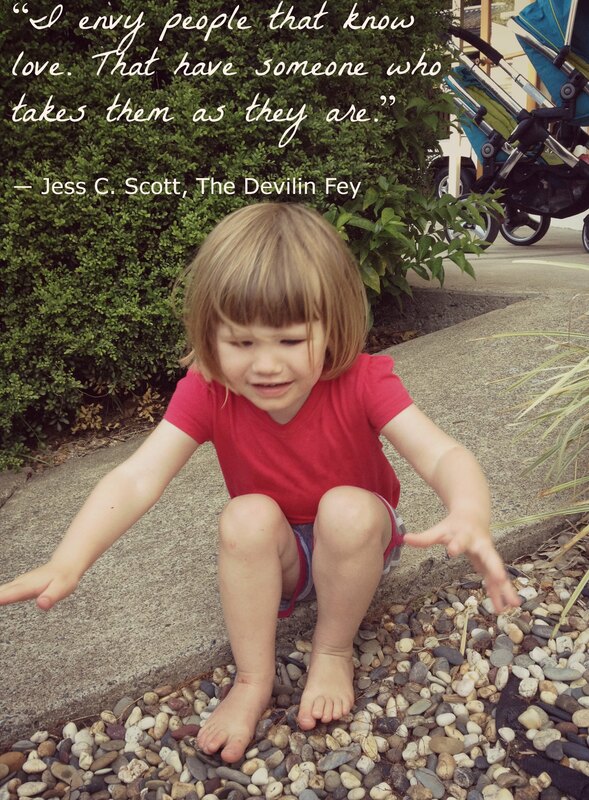 This entry was posted in Parenting Peacefully, Play and tagged Building a Trusting Relationship, Compassion in Toddlers, Empathy in Toddlers, Eyes of Compassion, Gentle Parenting, Respectful Parenting, Toddler Play on December 5, 2013 by peacefulparentsconfidentkids. Very little work for me this week (yippee!!) so more time for playing. The weather turned a little chilly here but the sun still shone so we still made our way outside as often as possible. 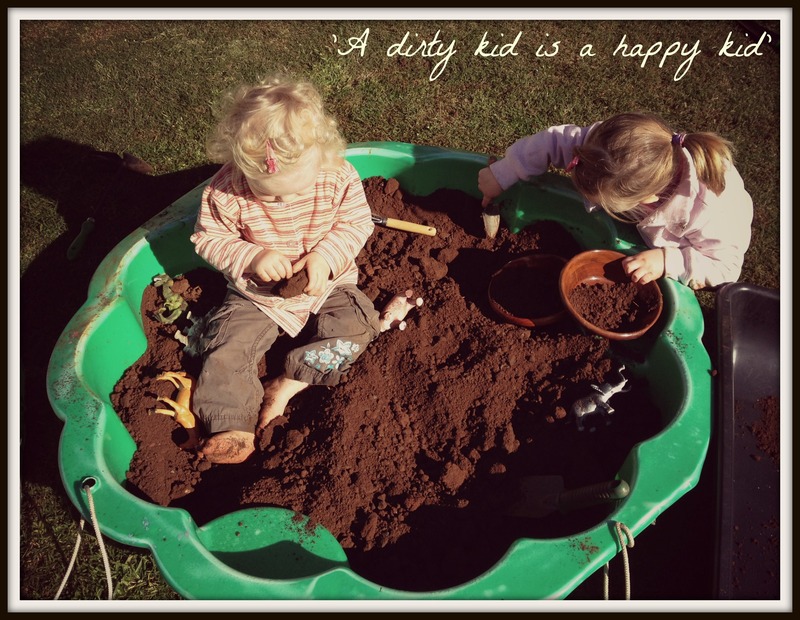 For a long time now I have struggled with letting my girls play in the mud and get dirty. It’s not that I don’t like this type of play, quite the opposite in fact. I love watching the girls go crazy in dirt but it’s the washing and the redressing that I dislike. Dressing the girls (especially my 2.5 yo) can be quite an arduous, long winded process and once it is done I certainly don’t wish to have to keep having that battle throughout the day. 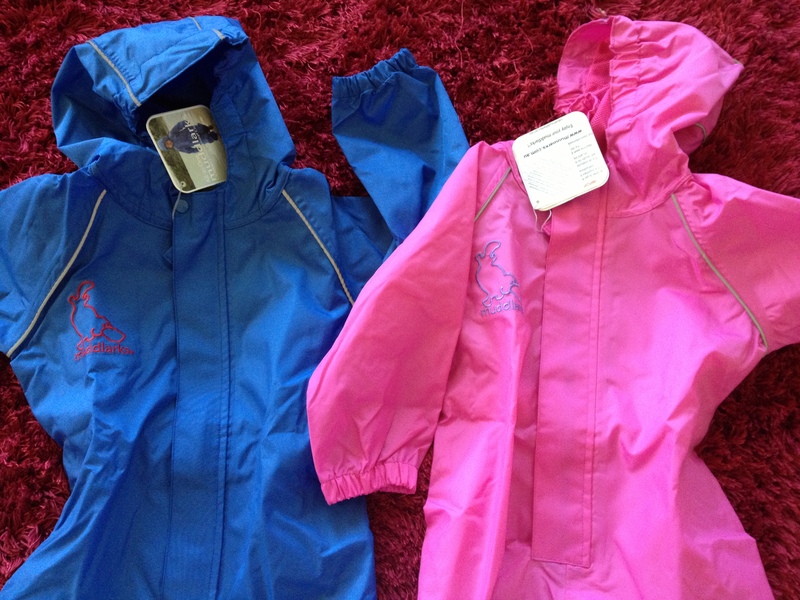 So, whilst, I would normally dress them in very old, already stained clothing etc for playing outside, what about when they have to go out; to a play date or the shops etc? I don’t really feel happy taking them out covered in dirt and mud. So if I know we are going out, the girls are dressed in clothes that are appropriate and it’s then that I loathe to open that backdoor and let them loose into the dirt pit before we go. But now, thanks to a brilliant invention, I no longer need to worry about this!! Lucy explored the properties of materials. Once she had delved through the different components of this invitation, I asked her which materials she found hard and which were soft. At first, she was a little unsure about the concept of these two properties. 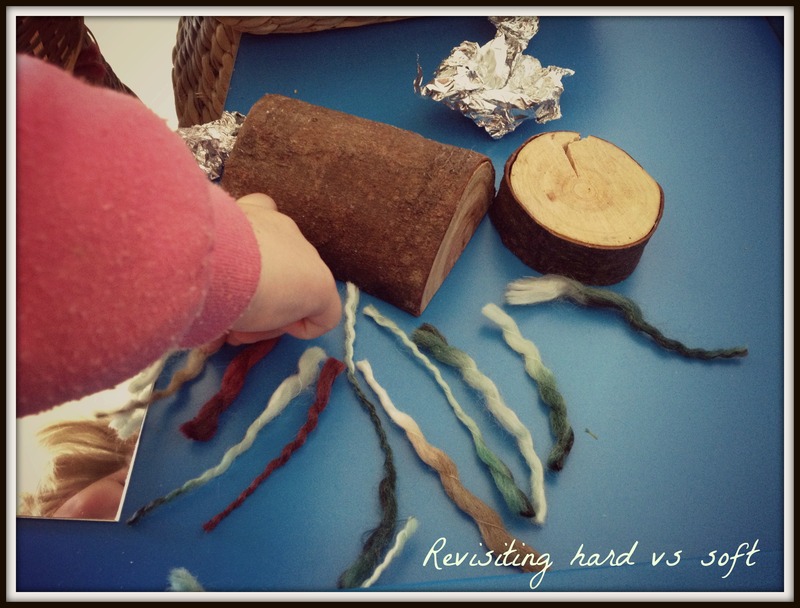 She thought the tree blocks were hard but when she picked up the wool she told me it was hard too. I asked her if she thought it was as hard as the blocks to which she replied ‘No mummy, the wool doesn’t make any sound, see!’ *bangs a bunch on the table* She then proceeded to pick up each object and bang it on the table to see what type of sound it made (by this stage she had removed most of the foil from around the blocks and so included it in her investigations). She concluded that the louder the sound, the harder the object. It was lovely to see her thought cogs turning from one simple prompt. With a somewhat destructive nature, I thought this invitation would be perfect for Lucy and I was right. After initially exploring the golf tees, she set right into hammering each and every tee into the floral foam before removing most of them and repeating. It was a great fine motor skill activity. 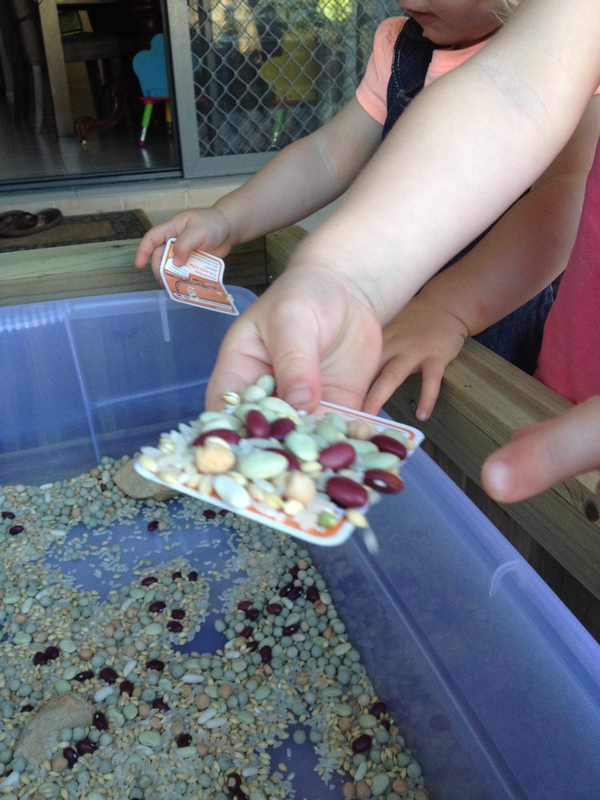 Lucy absolutely loves loose parts! To her, these are her ticket to make mess, to run her hands through them slowly at first, gradually picking up pace and to tip and scatter them into far reaching corners of the room. In the past, we have butted heads over her innate approach she has to playing with these little bits and pieces and I have since shied away from using them in her everyday play. 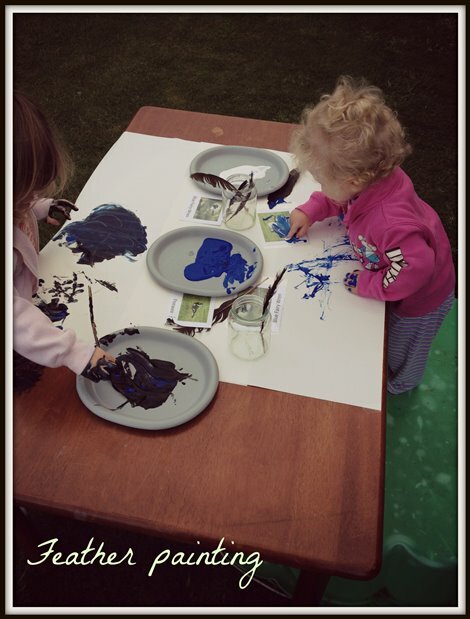 Whilst I had thought it would be a lovely opportunity for her to create in a serene way, she always had other ideas for them that never had anything to do with creating (unless you count creating a mess!). But in the recent months I have begun to embrace this quality in her and started to trust that the learning experiences she is gaining from her approach to play in this way is significant to her, for her age and stage. 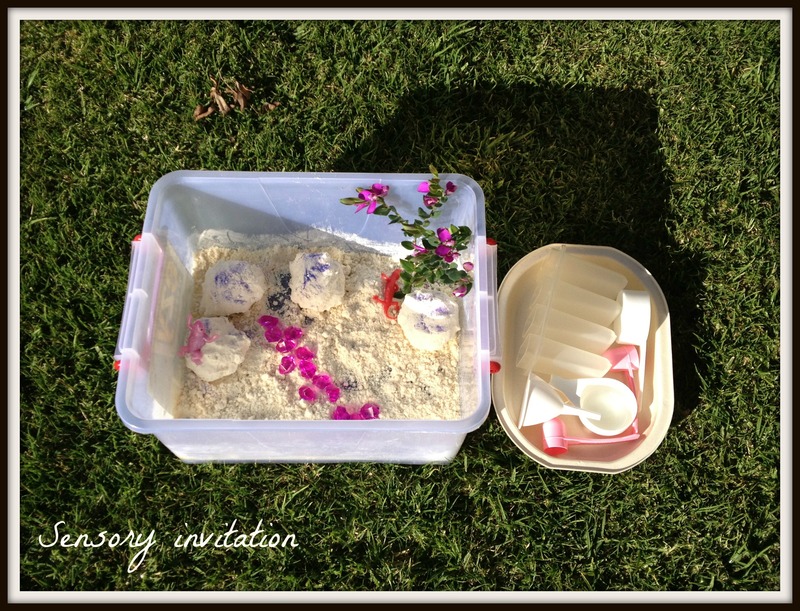 So, this week I set up this invitation to scatter using many different loose parts. 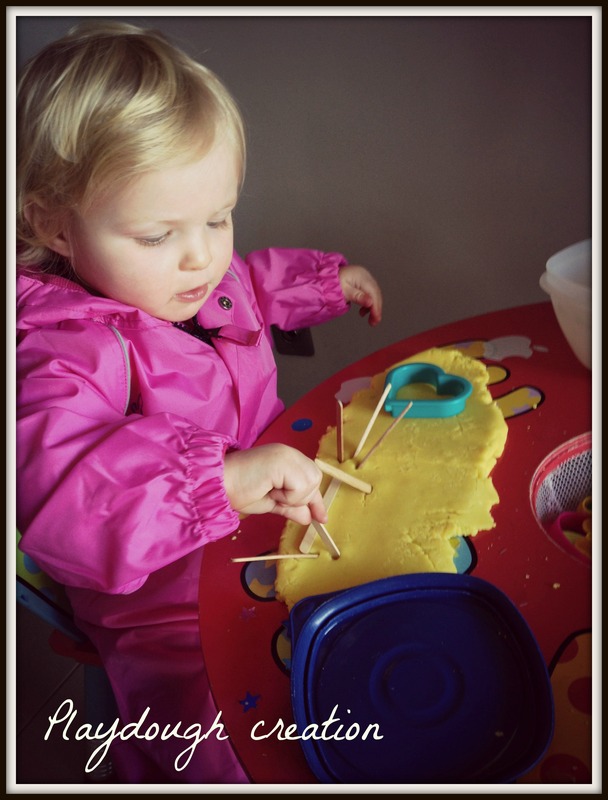 I was surprised by the care that Lucy displayed when she initially approached the activity. Furthermore, although she did tip the contents out after about 5 minutes, they all went pretty much into the mirrored tray where she then studied them, stirred them and ran her hands through them for an extended period of time. She eventually added saucepans and pots to create some ‘dinners’ and over the days I left it out for her and Penny to come back to, she has been remarkably restrained and much more purposeful in her play with them. They are still accessible in the play room for both girls and are being regularly revisited throughout the day. Muddlarks in action. 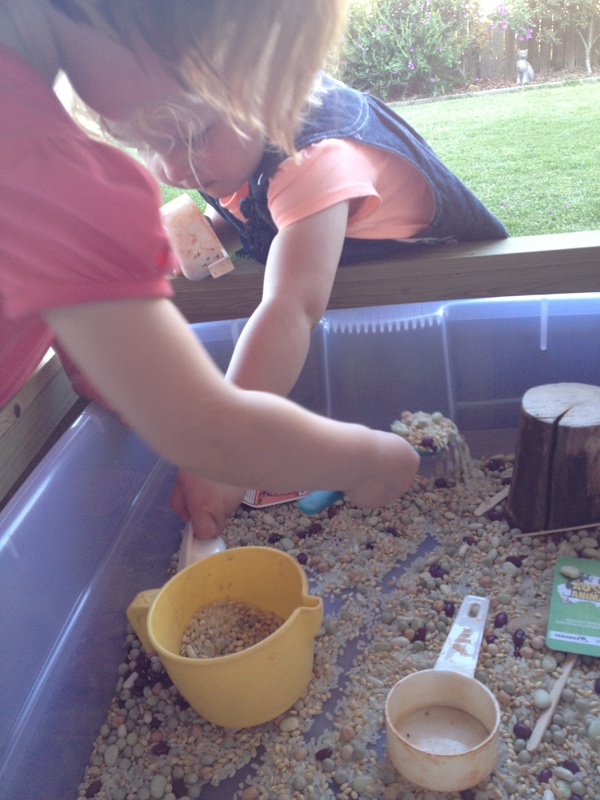 This lovely sensory play was well received by both girls. These frothy bubbles were easily made by mixing 4 tbs of dish detergent with 1/2 a cup of water and food dye and then blending for a few minutes with a hand blender until soft peaks formed. Add a few pots and pans, cups and spoons and you have a lovely medium to explore and cook up a storm. After most of the bubbles had been emptied into their pots, the girls added bark and dirt to the container and created a big mud pie. They were muddy top to toe but loved being hosed off before they came inside. 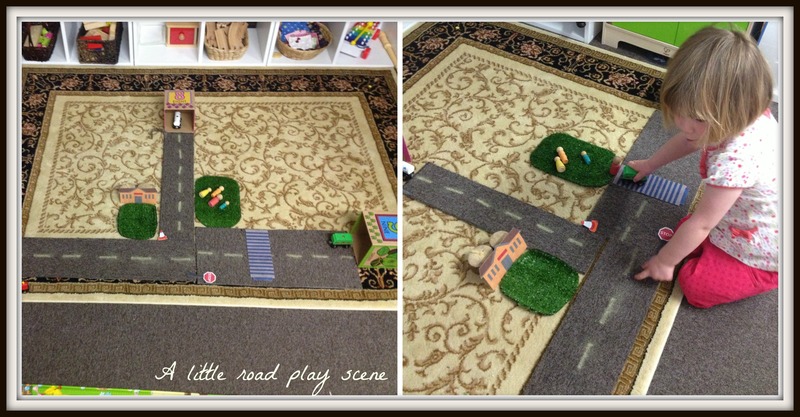 This entry was posted in Play and tagged allowing play at age and stage, Creativity, exploration based learning, Imagination, Infant learning, loose parts, messy play, Montessori Approach, Muddlarks, Natural development, Open ended toys, Respectful Parenting, RIE, sensory play, Toddler Play on August 23, 2013 by peacefulparentsconfidentkids. Another working week for me but still plenty of time to play, create, explore and discover. I am lucky that my job allows me quite a lot of time to think about activities for my children at home. It’s then just a matter of making it happen when I’m there. 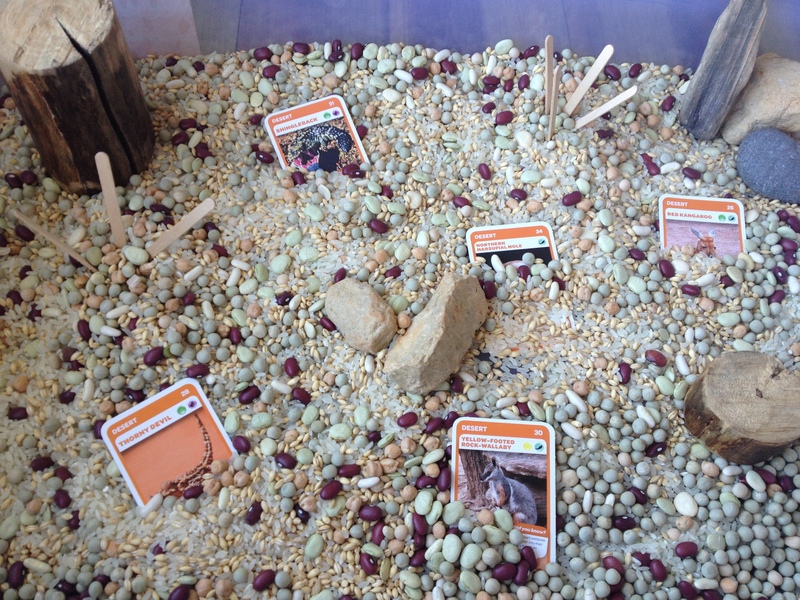 This sensory pit was recreated a few times this week as we all loved it. Yep, even me. I am the first to admit that I am not a bit fan of getting my hands in and squishing mushy oats, or goop or even just plain flour. I will do it when my children urge me to but the delight that I show them is not always how I’m feeling inside. Luckily, they are usually happy for me to be a present bystander whilst they explore!! 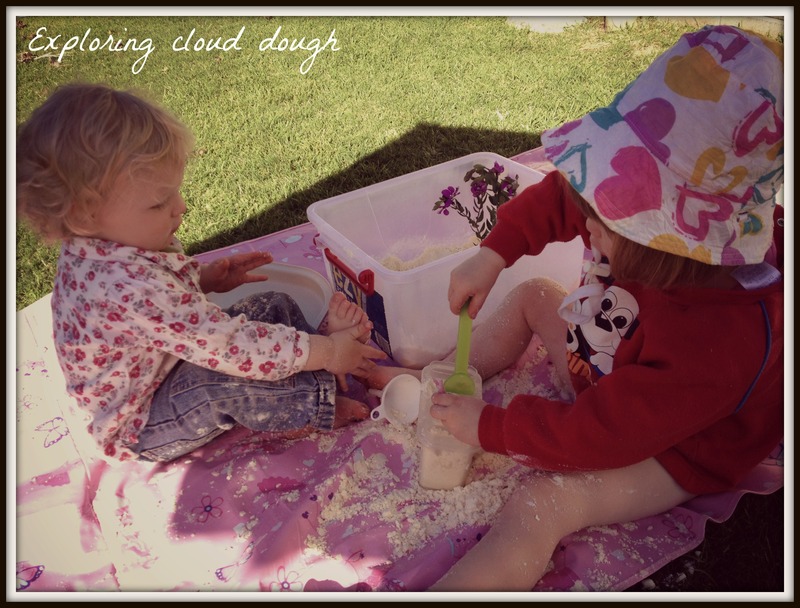 But with the introduction of cloud dough this week, a new side of me came out. I loved the light, soft texture and I found it incredibly soothing to squeeze it between my fingers and make shapes only to see it crumble apart when it was dropped, or squashed. Needless to say, the kids loved it too and the best part was despite feeling messy to play with, it was easy to clean up. This is definitely going to be repeated regularly in the future. A few new houses are being built across the road and we often head over (once all the workman have left for the day) and play in the dirt piles and explore the bits and pieces that are left lying around. On one of the blocks is a fairly big scrap heap and we noticed these large heavy duty cardboard tube scraps under some rubble. 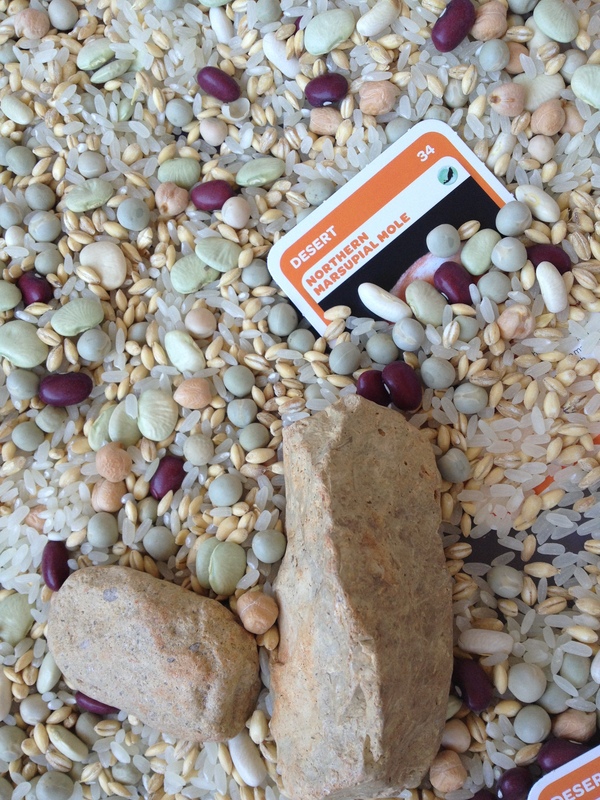 We dug two out and carried them home to see what types of play they could be used for. Lucy decided she would like to paint them so we chose some complementary colours together and I then left her to paint away. She asked me to add to her painting so, under her direction, I added some dots in a a few different colours and then left the rest to her. It was one of the first times that I have really seen her take some pride in her work. Maybe because it was something that would have an ongoing purpose and could be useful? These tubes have been used in a variety of ways including as a didgeridoo to make sounds, a megaphone to yell to each other and a telescope to look at each other close up. But the activity that has seen the girls both occupied for significant amounts of time is as seen above. The girls started by sending balls down the shoot and watching them fly out into the basket. Lucy then picked up a stone and asked ‘can this go down?’. I didn’t need to respond with much more than ‘I’m not sure?’. She tested the theory herself and tried all sorts of objects big and small to see which ones went down easily and which did not. She quickly determined that the round objects were the easiest to send down whilst the irregular shapes of her puzzle pieces for example did not flow so easily. It was lovely to hear her talking herself though the project. Not really wanting my input but rather using me as a sounding board for her own rhetorical questions. This road scene did not get as much use as I thought it might. We have had some troubles recently with the girls trying to run onto the road when we play out on the front lawn so I set this invitation up to see whether we could play out the consequences of running onto the road without looking etc. I think I needed to become more involved once the initial exploration had taken place or even from the beginning, seeing as this is such an important issue. Perhaps I will try again but use the scene as a prop to tell a story etc. We may revisit this during the upcoming week. And, finally, my last post detailed a bird project we have been undertaking which has encouraged many birds in our yard such as magpies, house sparrows and crows but no colourful or more exotic birds. Now I know, rosellas are not exactly exotic but this beautiful couple have been to have breakfast and dinner in our backyard for the past three days and we are all super excited! They are simply magnificent to watch, even if we have to stay inside to do so. We had to do a little research to correctly identify them and we are fairly sure they are pale-headed rosellas. I can’t tell you how great this experience has been for the girls and I love the ongoing nature of it. The anticipation of which bird is coming next is thrilling! 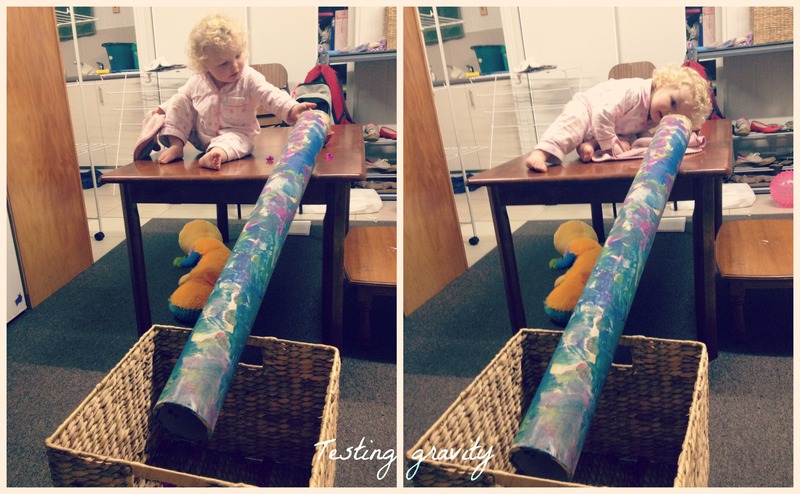 As you know, I love to create little activities that invite my girls to discover, investigate and explore in their own way and in their own time. I have learned not to have an ‘agenda‘ with these invitations, knowing that my children’s minds, unlike mine, are blank slates with no preconceived ideas or expectations and consequently they engage in activities far differently than I would even dare to imagine. My imagination and creativity has been reduced as I have grown up through life but theirs is still blossoming and developing and I love to see where it takes them through these invitations. The girls have always approached these activities with excitement and I have never had one overlooked or rejected. Now, this sounds wonderful and amazing etc but the reality is that the average time that it takes my children (especially my two year old, Lucy) to discover an investigation, form a hypothesis, test it and then reach her conclusions, is roughly five minutes. And whilst I appreciate that age is not in her favour when it comes to attention span, I have often wondered whether there is something more to her seemingly limited one. I have read and reread articles and examples from Janet Lansbury, Lisa Sunbury Gerber and a whole host of mothers who follow Magda Gerber’s RIE approach claiming that their (even younger) children are capable of playing for much longer periods of time on just the one activity. And, as I think about it, I realise that even my youngest, Penny (nearly 18 months) has shown more ability to stay focused on a task for extended periods of time. So what makes my eldest child become disinterested quickly in activities that I take a great deal longer to set up than she does to play them? Deep down I have known the answer to this for quite sometime. 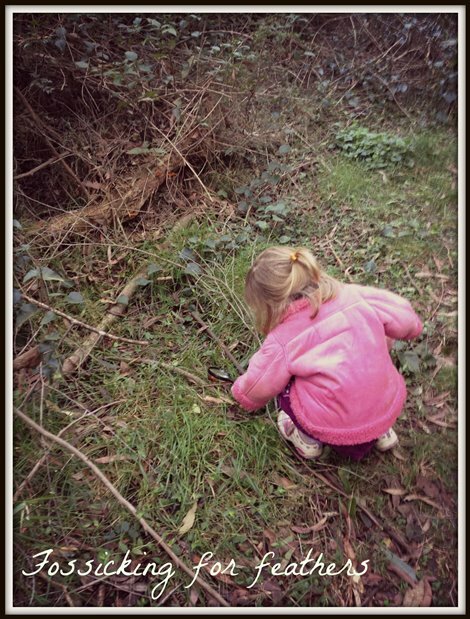 Through my wonderful association with Kate from An Everyday Story, I have learned that in order for some children to become invested in their play, it needs to be something that they are already curious about or have initiated completely on their own. When providing them with opportunities for play and investigation, taking this into consideration can be the difference between them engaging with the task for prolonged periods of time (even days or weeks) and investigating it at a surface level only, skimming over the top and never truly wanting to do more. Now, it can be very hard to really know what your child is interested in, especially if they are pre-verbal or still a little young to have obvious obsessions or interests. But the clues are there if you look. It could be that they have articulated an interest through asking a question or making a comment or it could be communicated in other ways such as through pretend play, an obsession with a particular book or simply showing delight during an experience they have had organically (ie through the normal course of daily play, outings or activities). I have realised that whilst I was (and still am) providing my children with many fun and enriching experiences I was failing to involve them in the production of these. It’s like someone continually offering books for me to read on a topic about which I have no interest. I would probably start the book to see what it was like but would most likely turn away from it before it was finished if it did not tap into my own interests. This is precisely what my eldest child seems to be doing with my wonderful activities. So, having had this revelation, I started really listening to my children; engaging them in conversations, watching them in play, looking for any signs of a deep seated interest or a curiosity that could be tapped into further. It came one day recently when we were walking through a little forest at the end of our street. We often head down there of an afternoon as the kangaroos are out for their dinner and many birds are flocking, returning to feed and roost. We were sitting on a little vine that had grown into a U shape, perfect for swinging lightly back and forwards, when a bush turkey suddenly ran across the track in front of us and then flapped clumsily on a low branch of a nearby tree. Both girls sat captivated as it flew from branch to branch looking for a high place to safely bunker down for the night. By the time it had settled it was so high up that we could only just spot it. It sparked a noticeable curiosity in Lucy and certainly seemed to capture Penny’s attention. As we were walking home, Lucy spotted a large, black feather on the ground, we picked it up and surmised about which bird could have lost this feather. We spoke about which birds were black including crows, magpies and pee wees as well as the most likely culprit, the bush turkey. 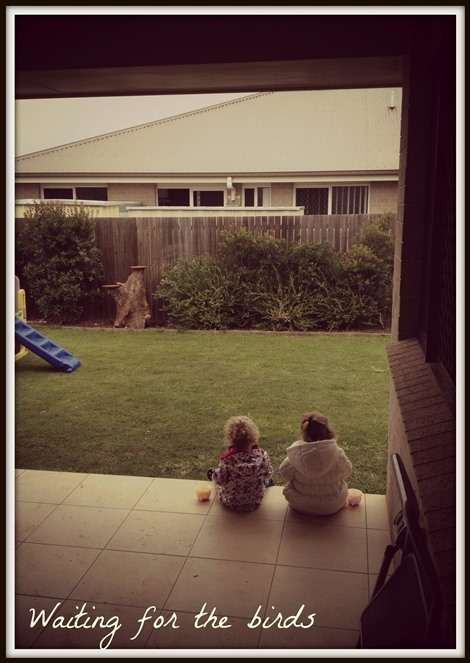 The next day, we had a magpie visit our backyard (as we often do) and Lucy was very excited to see it and asked if she could ‘give him her lunch’. Over the next few days and weeks, I thought about how I could keep this interest in birds alive through way of a project. I came across Kate’s lovely and inspiring bird project and was instantly struck by how simple, yet engaging and purposeful her ideas were. 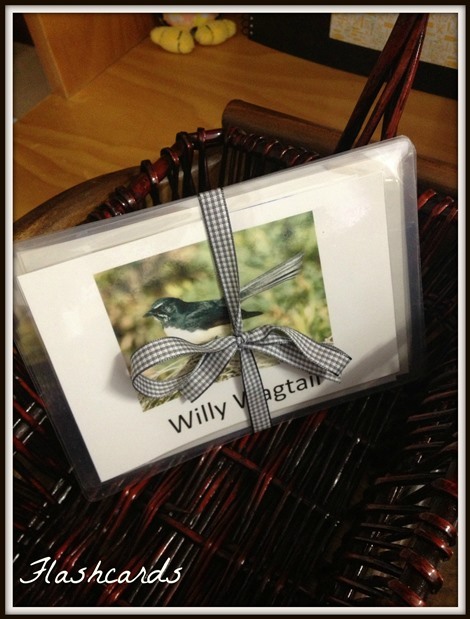 They were appealing to her children and allowed them to explore birds on many levels, in a meaningful and deep way. And thus began, our first project. Firstly, as we had not a single bird book in our house, it was off to our local library to pick up some lovely child friendly ones the girls would enjoy, including a guide to Australian birds. Lucy really enjoys books so this was a perfect medium for her to learn more about these fascinating creatures. We flicked through the books and looked for birds that were familiar. 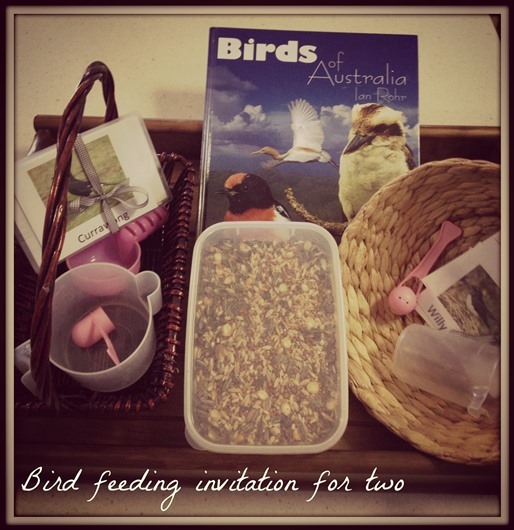 I was surprised by how many birds Lucy knew already by name such as crows, magpies and kookaburras. On our outings, we began noticing birds all around us, we spoke about colours and sizes and worked out the names of the ones we were not sure of using the guide book and the internet. 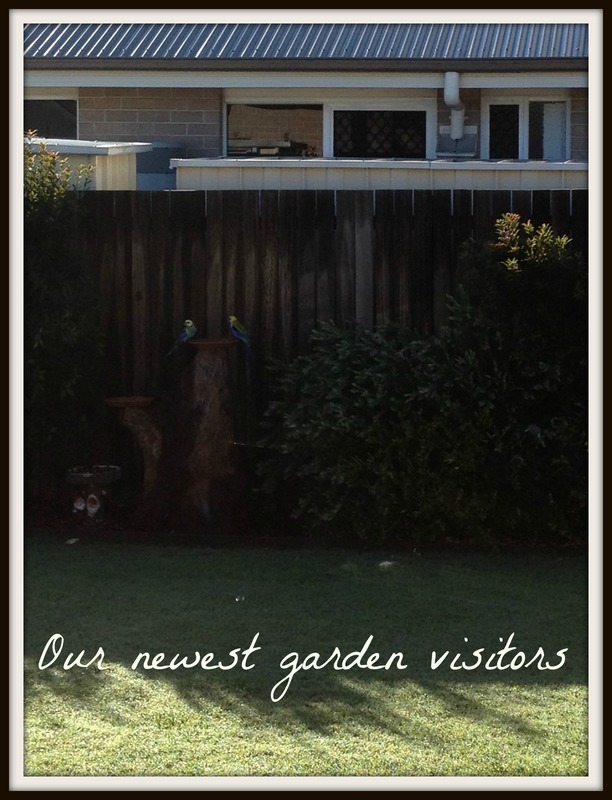 Keen to see more birds in our fairly sparse backyard, I spoke to Lucy about what would make them come down and visit us. Living relatively close to a small forest we actually get many birds flying overhead in the afternoons but they never stop to visit. Lucy thought that by calling to them they might come down so we tried but to no avail. It seemed they were not listening. 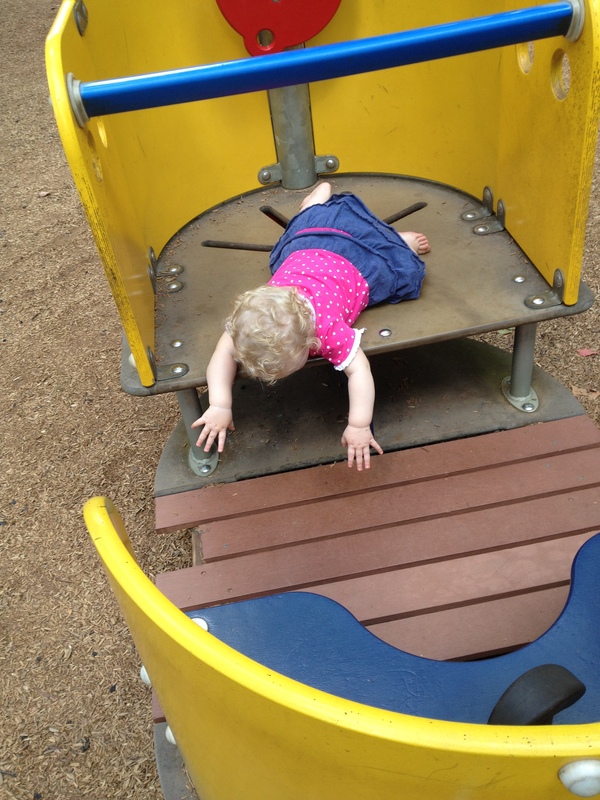 I asked her where she thought they might be flying and she thought maybe ‘the park’. We then worked out that after the park they would head home for a bath and some dinner (as is our regular afternoon routine). So I took the lead for an invitation from this and decided on making a bird feeder so the birds could have dinner with us. 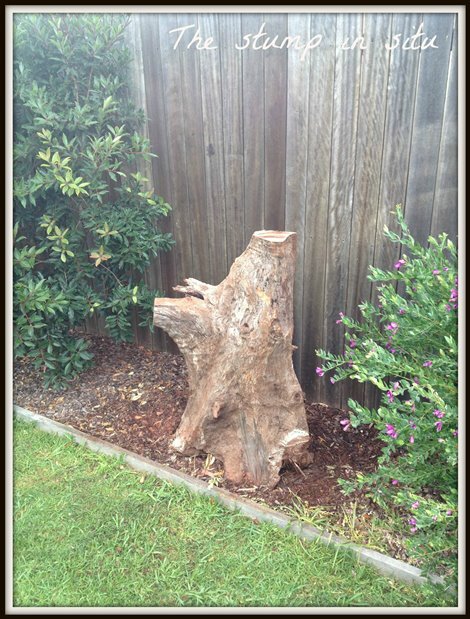 As luck would have it, amidst all our bird studies, my husband and I had come across a lovely old stump in a big dirt pile in a development across the road. 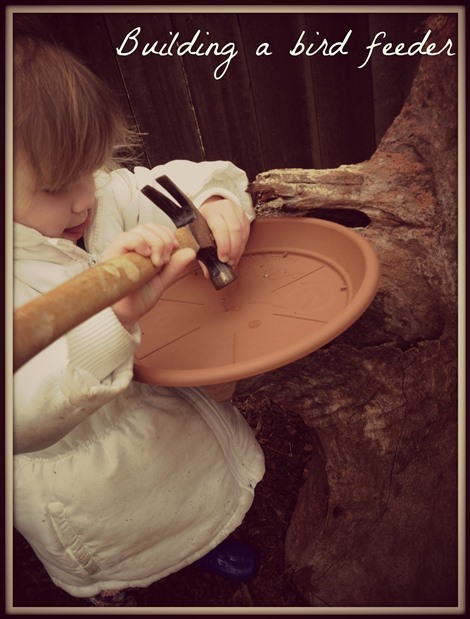 In An Everyday Story’s blog, her children had built a simple bird feeder to encourage more birds into their yard using a similar stump. I set up some tools and materials in an engaging yet simple way to ensure the girls were not only involved in the project but could take some ownership and responsibility for it. It was exciting for them as they thought about all the birds they might see coming for dinner. 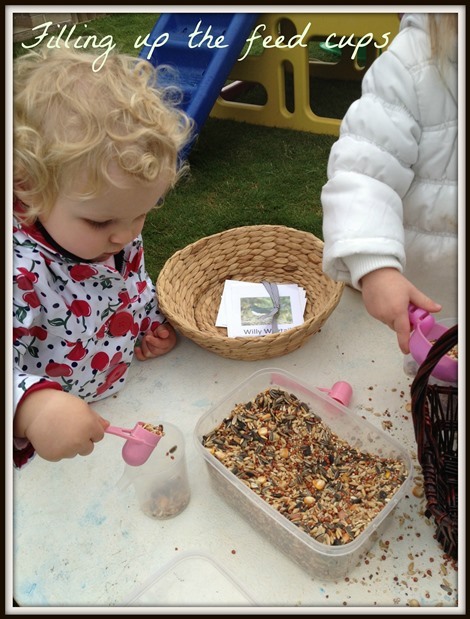 Lucy was responsible for building the feeder and then both the girls worked carefully scooping, pouring, carrying and filling the bird seed using cups and scoops. It took about a day before we saw our first bird visit the bird feeder and although it wasn’t a beautiful or exotic one the girls were so excited to see a peewee eating their seed. It must have felt so fulfilling for them to have been through the process and then seen its purpose come to fruition. To help with our bird identification, I made small laminated cards for the girls (a set each) using only the birds I knew were in the area. 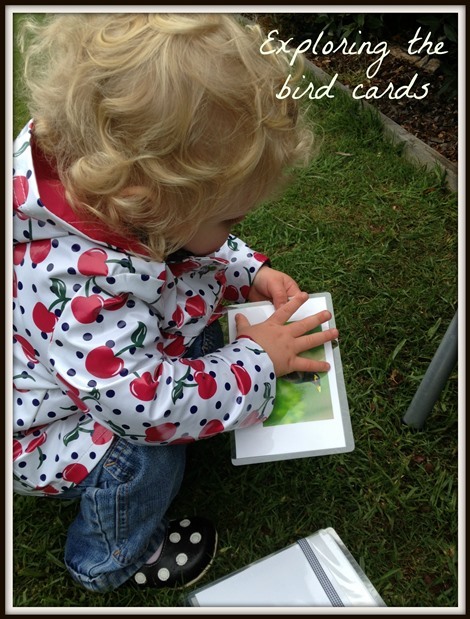 These have been wonderful for the girls as they have watched a variety of birds come to feed and then used the cards to identify each one. To further our study into the birds we collected more feathers on one of our walks and then did some painting using them as brushes. We also regularly use the little laminated cards in matching games which Lucy is becoming very adept at. She is now able to articulate the names of most of the birds that come into our yard including currawongs, peewees, house sparrows, blue fairy wrens (our favourites) and willy wagtails. 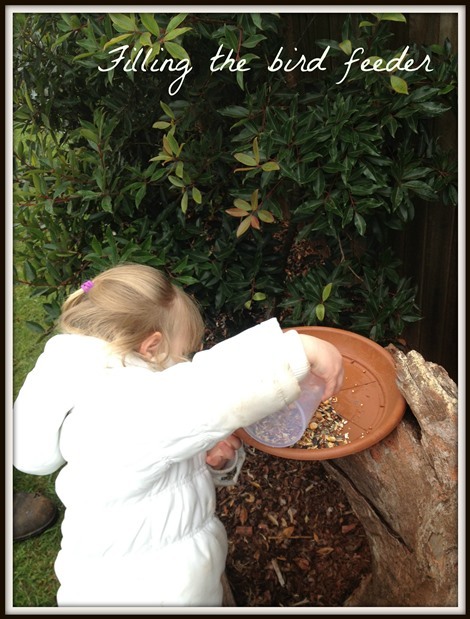 The girls continue to feed the birds on a regular basis and have since added a bath for them to wash in. I am hoping that by planting a few more native shrubs this spring we might entice some more colourful birds in through the warmer months. It has been so wonderful to see my children learning in a meaningful way and although I will continue to offer them invitations to explore in a variety of mediums and contexts, I am now more open to using my children to steer the investigations based on the interests that they develop along the way. 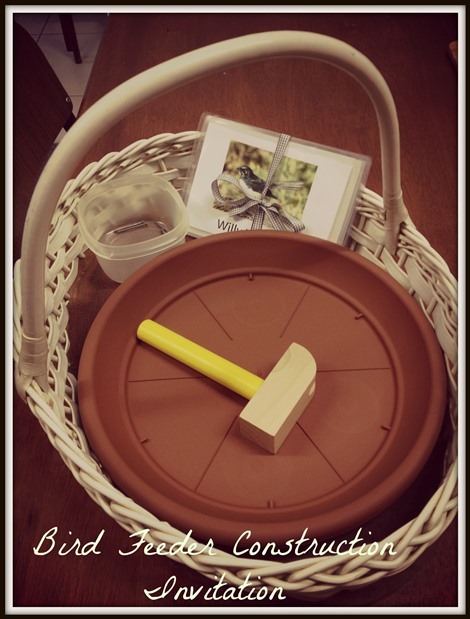 This entry was posted in Play and tagged allowing play at age and stage, Bird project, Communicating with Babies, Creativity, explorative play, Imagination, Infant learning, Problem solving, Respectful Parenting, RIE, Toddler Play on August 15, 2013 by peacefulparentsconfidentkids.